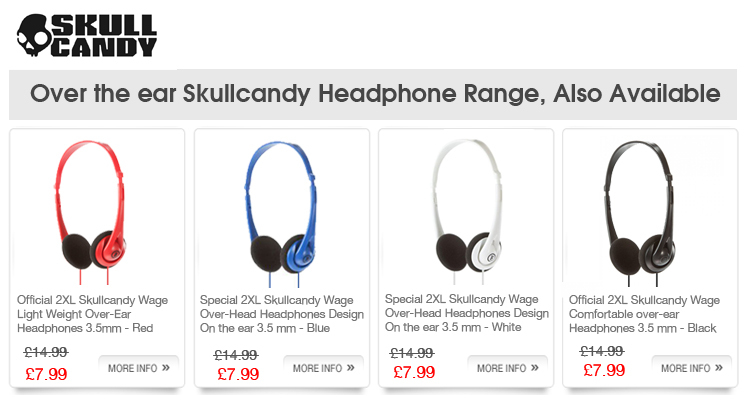 Genuine Skullcandy UK In-ear White Headphones for Mobile Phones & Tablets. 2XL is a lifestyle audio brand dedicated to helping others excel in everything they do, delivering products with meaningful performance and individual style to help stimulate aspirations and dreams. 2XL, a Skullcandy division, produces affordable music and audio headphones in a varied selection to satisfy the style conscious consumer. High quality material, finish and manufacture make these 2XL headphones the perfect accessory for music lovers. These headphones from 2XL are compatible with most MP3 players and devices that use a standard 3.5mm jack including iPhone, iPod, iPad, 2, 3 and Mini so that you can enjoy your favourite music easily. Avoid using headphones with the volume turned up for an extended period of time. Doing so can damage your hearing. It is advisable to keep the volume at a moderate level at all times. For your own safety, please do not use when driving or cycling. Get immersed in the music with Skullcandy X2OFFZ-819 Offset 2XL White. These stylish White-Headphones from Skullcandy will take your music listening experience to the next level. With a 3.5 mm plug, the style-factor of earphones gets higher. With a cable length of 1.2 metres, you can enjoy your favourite music with ease. Other features of the earphones include 30 mm driver diameter, maximum input power of 100 mW, 32 ohms impedance, 20-20,000 Hz frequency range and NdFeb magnet. Specifications Brand Skullcandy Type In-ear Headphones Model X2OFFZ-819 Offset 2XL Colour White Driver Diameter 30 mm Plug Type 3.5 mm Max. Input Power 100 mW Impedance 32 ohms Frequency Range 20-20,000 Hz Magnet Type NdFeb Cable Length 1.2 M2XL is a lifestyle audio brand dedicated to helping others excel in everything they do, delivering products with meaningful performance and individual style to help stimulate aspirations and dreams. Get immersed in the music with Skullcandy X2OFFZ-819 Offset 2XL White. These stylish White-Headphones from Skullcandy will take your music listening experience to the next level. With a 3.5 mm plug, the style-factor of earphones gets higher. With a cable length of 1.2 metres, you can enjoy your favourite music with ease. Other features of the earphones include 30 mm driver diameter, maximum input power of 100 mW, 32 ohms impedance, 20-20,000 Hz frequency range and NdFeb magnet.